The success of a wedding is partly because of the people that came to celebrate it, so the uncontainable urge to say thank you is there. But, it is definite that you will not be able to say thank you to each and every guest that came by to celebrate the beautiful affair with you as you are bound to do so much more than just say thank you to every guest, thus the need of something that is able to do so collectively and effectively, the wedding thank you postcards. A medium that is not only a tangible representation of your gratitude towards their attendance but that can also serve more than it is asked for. Knowing that any person directly involved in a wedding is someone who is hard to grasp on the wedding day— guests, plans, setups to think about, too many concerns. This causes the need of a medium that does the job for the person. 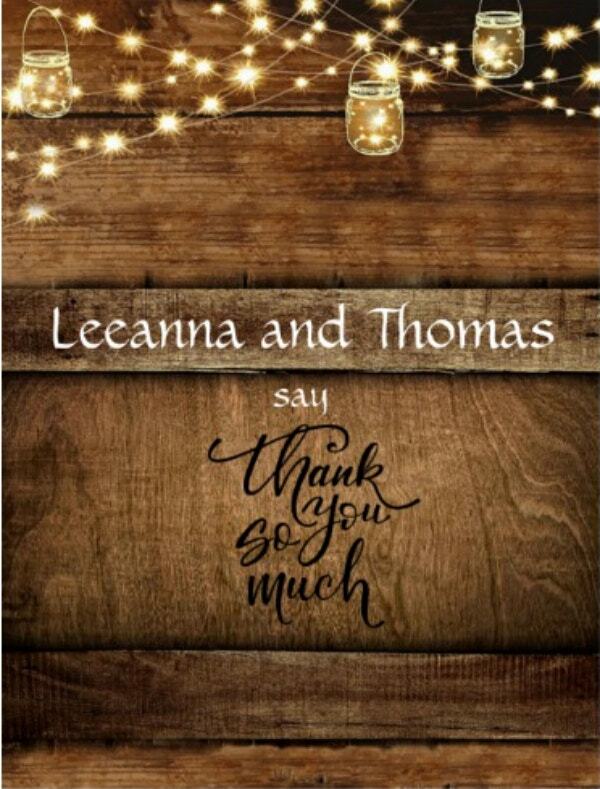 With that said, if you are someone planning to marry or is about to get married and is looking for ways to remedy the struggle of expressing your gratitude towards your guests, here is a list of wedding thank you postcards you can hand out to every guest for that assurance of relaying the message and to simply not discredit anyone for their effort, whether big or small. 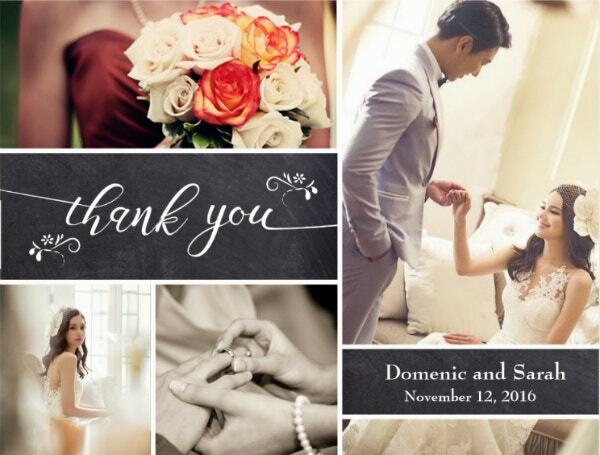 Weddings are one of the most common events a thank you card is profusely used. This is where a thank you becomes a gesture of excitement and bliss. And for those who opt to use it, a thank you card is a representation of their emotion that they cannot evoke on the day— to say thank you to the couple. For weddings, it has been a custom to say gratitude to all the people who have taken the time and effort to be with you on your special. Some couple simply creates a speech and collectively say their words of gratification to everyone. Others simply fail to do so due to how hectic and overwhelming the day is. However, PSD thank you card, which is in a way going the extra mile, is a gesture and medium that collectively and effectively says thank you to everyone around. Although it is a very simple gesture, its simplicity elicits happiness, excitement, and uncontainable bliss towards everyone who came to attend. 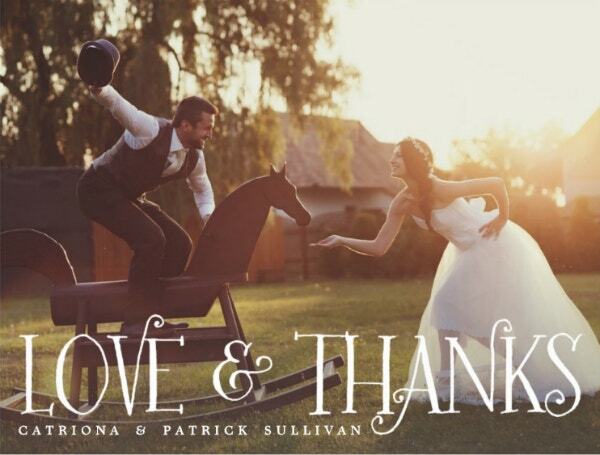 Furthermore, thank you cards in weddings are often said in many different ways. Some say it as it is with “thank you” written across the card, some go as simple as “thanks” or as elaborate as “love and thanks” or even “many thanks from”. Depending mostly on how creative you can get. What Are The Benefits Of Giving Your Guests A Thank You Card? Just like by simply sharing your gratitude towards the people who attended your beautiful wedding, opting to do so through a more tangible medium by handing out thank you cards have benefits that most fail to recognize. With this simple gesture of gratitude, a thank you card entails benefits that your guests can carry on for the rest of their life. With that said, here is a list of different benefits a thank you card has when chosen as a medium for an event. Considering that a card is tangible and you opt to show your gratitude through a more tangible medium, guests are able to keep the thank you cards as a memorabilia for keepsakes for as long as they can. They will be able to keep it and look back on it at times of solitude, especially when they get a little too sentimental and reminisces on the moments the sample card entails. That is actually one of the beauties of having a more tangible medium to show your gratitude, that is people get to reminisce and look back on it when it calls for it. Giving out thank you cards on your wedding day simply mean that you appreciate the effort your guests gave for you on your wedding day, no matter how big or small. It will simply make them feel both loved and appreciated even if for being simply there on the most beautiful day of your life and experiencing the most beautiful and magical emotions of being in love. And with such a simple gesture of love and appreciation, by giving them thank you cards, it will only fill their hearts with so much joy and happiness. You may also see wedding invitation postcards. Expressing how one feels is not always easy, much more enunciate it to the person they intend to address it to. Entirely expressing your emotions can be a bit of a struggle, but thank you cards can simply help aid that. You just simply have to write down your gratitude in words that best express and evoke your thankfulness, and in a way, you are already expressing yourself to all your guests that came to witness your wedding. True in the case when you take the time to sit down and put to words, either concisely or elaborately, how you feel about them attending your wedding, which will simply translate as a sweet and sincere gesture. You may also see event postcard templates. What Should Be On Your Thank You Card? Aside from those pre-written thank-you phrases said in various creative ways, there are also other things that should be on your thank you card. Altogether, these pieces of information and design elements create for a more unique-looking and more personalized card. Though each card may appear to be different from one to the other, they somehow share the same pieces of information or designs, just said or presented differently. With that said, here is a list of the different design elements and pieces of information that should go on your thank you card. 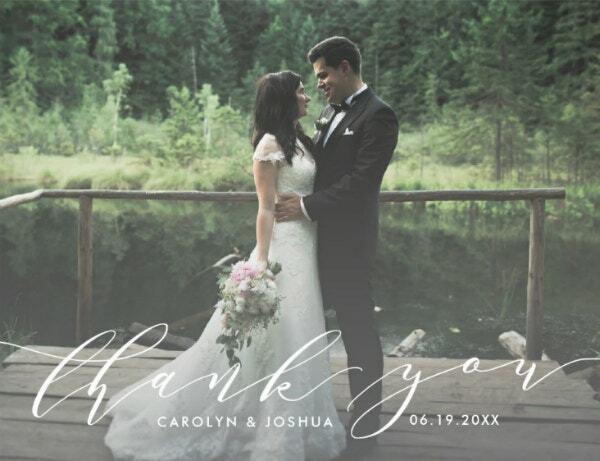 A photo of you both will simply add to the design element that will be added to your thank you card and more importantly it will act as the cover page of the card. To also note, you cannot limit or restrict yourself with just photos of you two for you can also use images that is related to the event, such as a photo of two rings or two hands bound together, there are definitely so many ways to depict wedding which will easily translate to your guests. And doing so will instantly give away the idea that the card is a thank you to your guests for attending your wedding. It is also ideal that you have a cover and a spare page, so you will have enough space to write down your own personal message. This phrase will simply give away the idea that it is meant as a thank you card. However way you wish to say it, it is ideal to have a pre-written thank you phrase on the card. You can maybe simply say “thanks” or as it is “thank you” or even “love and thank you” or “many thanks from”. There is an indefinite way to express your gratitude, depending mostly on what you prefer. You may also see blank postcard templates. It is important to identify who the card is for and to do so, you simply include the name of the recipient on the thank you card on the card. Names generally make everything more personal and unique and so having your guest’s name on it will ultimately make each card also unique from each other, especially when the names are handwritten in calligraphy style for that extra touch of flair. Although it does not have to be necessarily personal, just the thought of a handwritten message on a premade card is enough to qualify it as personal. And to do so, you have the spare space left for you, which gives you the privilege and opportunity to write down your very own message for your guests. You can write in varying tones that you best prefer, like in a meaningful way, a serious tone, or even go for a funny tone, but always have in mind to keep it sincere and heartfelt. You may also see holiday postcard templates. Simply writing down your own personal message will make the card more special and the recipient feel loved and appreciated, especially considering that you took the time to put into words how you feel towards your guests. And if actions speak a thousand words, what more when there are a thousand more in it? If you find this article helpful in any way, do not forget to bookmark this page for future references. 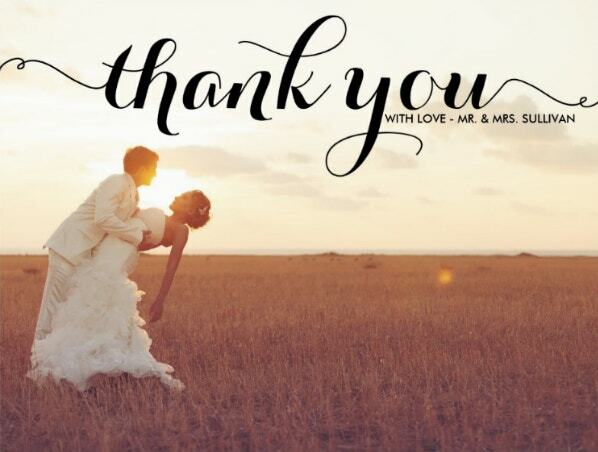 Kindly share this with other individuals or couples seeking the best thank you cards to use and hand out to their guests on their wedding day, to fully express their appreciation and gratitude for simply being there. You may also see photo postcard templates.